PANGKALPINANG - Government Pangkal Pinang, Bangka Belitung province, will take advantage of a hole (pit) former tin mining area attractions become attractive. "We'll find a third party interested in using the hole or under the former tin mining area is as attractive tourism objects," the mayor said Zulkarnain Karim Pangkal Pinang in Pangkal Pinang, Tuesday (5/1/2010). He explained, Pangkal Pinang has 19 under the former tin mining area of 183.47 hectares with scattered in various places. "Now, under such a swamp that became the source of disease and some people used to build a home," he said. He said that, under the City Government's Pangkal Pinang and is identified so that residents use is not justified. "To pit the former lead mining was not a swamp, well managed and used as attractive tourism objects, some can be used for shelters to cope with the flood water," he said. He said, under these artificial tourism potential if managed properly, such as water attractions and so on. "That's, we welcome that, investors have looked at the area under transformed into an attractive tourism destinations," he said. According to the mayor, the hole former tin mining was also functions to accommodate the rain water with a high intensity so that the city was not flooded. "In other areas intentionally made under the (big hole) for rainwater to prevent flooding during high-intensity rainfall. Pangkal Pinang no longer needs to make a hole for tin mining hole enough to accommodate the rain water," he said. In the village of Kuto Panji, Belinyu District, Bangka, there is a place of spiritual tourism. This name is Kak Liang Pha. This is the temple erected in the area of the former tin mining. Dug holes under the so-called tin forming the lake. 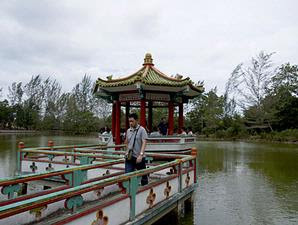 In the middle of the lake was built gazebo with winding bridges that connect it with the mainland. On the side of the lake at a higher level there is a small temple sanctuary. In the lake area of approximately 2 hectares lives of hundreds, even thousands of carp, bawal land, and indigo. It is said that fish in the lake there is a big reach 1 meter. Tell the truth because since the seed was first stocked fish in 1995 was never a single fish could be arrested. Many people from different beliefs come to this temple to enjoy the silence and prayer.